Tanagura"- Little Kyoto" SUBPAGE | All Japan Kyoto Association"
Located at the southern end of the Tohoku northern Japan region, Tanagura welcomes people to beautiful seasonal attractions – cherry blossoms in spring, fresh green in summer, colored leaves in autumn and snow scape in winter. Many old historical sites still remain in the town including temples on the mountain and important shrines such as Baba Tsutsu Kowake Shrine (the most important shrine in the Mutsu area) and Yatsuki Tsutsu Kowake Shrine (the most important shrine in the Oshu area). The first samurai lord who ruled the Tanagura area after the Tokugawa Shogunate was established was Muneshige Tachibana. Later, Nagashige Niwa constructed Tanagura Castle. The castle served as the residence of eight clans for 16 generations and the town around the castle was developed as well. In 1622, a samurai lord, Nagashige Niwa was transferred to Tanagura from Futto of Hitachi province. Under a commission from the shogunate, he started to construct a castle. In 1624, Niwa relocated the local deity, Chikatsu Myojin (or Tsutsukowake Shrine), to another location and began the construction of Tanagura Castle in 1625, which was completed in 1627. During the long 240 years of its history, the castle served as a stronghold of the master samurai from eight clans and for 16 generations but fell in 1868 during the Boshin Civil War. A funny legend about the castle is that the castle masters were transferred whenever a large turtle appeared on the surface of the surrounding moat. Therefore, the castle was also called Kamegajo Castle (the Castle of Turtles). Several stone monuments stand on the earthen wall. Another historical remains is the stone wall which extends for about 160 meters on the western side of the outer moat. After going along the road lined with 100-year-old cedar trees and walking up the 130 stone steps, there is a large cave where the principle worship image is enshrined. During his pilgrimage in the northern Japan, Kobo Daishi stopped here in 807 and established a sacred altar in order to get rid of the demons and bad fortune around Mt. Yamizo. Thanks to his merit, the area has been peaceful since then. The ravine, extending from north to the south for about 5 km, is designated as “Okukuji Prefectural Natural Park.” Spring is the time for rhododendron (mid to late April), Yamazakura wile cherry, and Iwatsutsuji azalea. Camping and colored leaf viewing are also the seasonal highlights. 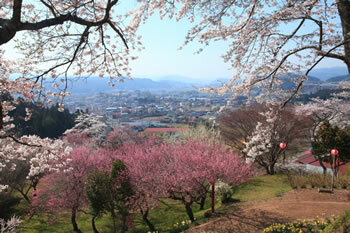 Akadate Castle sits on a hill 345 meters above the ground in the northern area of Tanagura. 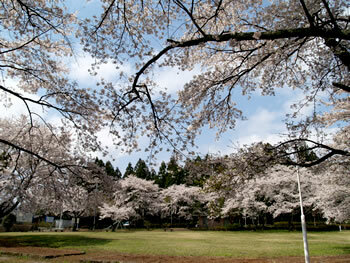 The local governor lived here and ruled the area until Tanagura Castle was established. The view of the town from here is superb. At the southern foot of the mountain is a traditional house in which Gyokushitsu, a chief monk of Daitoku-ji Temple in Kyoto, lived after he was exiled due to the political conflict. Few historical records exist today about Akadate Castle and the year of completion is still unknown, however, one record attests that there was a castle master named Igajiro Akadate here in the 14th century so that it is a fact, at least, that the castle already existed at that time. 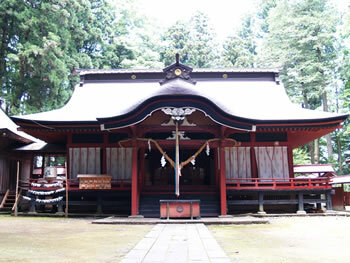 This is one of the three Tsutsu Kowake Shrines which were counted as particularly important Shinto shrines as the “Chikatsu Three Shrines” (Baba Tsutsu Kowake Shrine, Yatsuki Tsutsu Kowake Shrine, and Shimomiya Chikatsu Shrine). In ancient times, the legendary imperial prince, Yamato Takeru, conquered the northeastern area and constructed a shrine on Mt. Tatehoko (in Shirakawa City). Later, in 807, a samurai warrior, Tamuramaro Sakanoue is said to have moved the shrine to the location where Tanagura Castle was later constructed. Then, in 1624, the castle master at that time, Nagashige Niwa, moved the shrine again to the present location in order to build his castle. The shrine enshrines Ajisuki Takahikone and Yamato Takeru. Many of the trees in the precinct are over 100 years old. The Main Hall was relocated from the previous site where Tanagura Castle was located. The Hai-den Hall employs special architectural styles which emanates a solemn atmosphere. There is a monument where Shokin Katsuta, a modern Japanese painter born in Tanagura, kept his used painting brushes. Some of the shrine treasures include two swords (National Important Cultural Property) which were donated by Yoshiie Minamoto in the Kamakura period (12-14th century) and part of the samurai armor (National Important Cultural Property) which is decorated with red thread. This is one of the three Tsutsu Kowake Shrines which were counted as particularly important Shinto shrines as the “Chikatsu Three Shrines” (Baba Tsutsu Kowake Shrine, Yatsuki Tsutsu Kowake Shrine, and Shimomiya Chikatsu Shrine). According to the shrine’s record, the legendary warrior, Yamato Takeru was protected by three deities when he conquered the northeastern area. The deity shot an arrow from Mt. 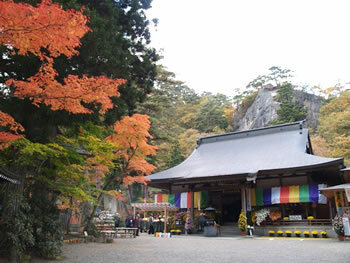 Tatehoko and Tsutsu Kowake Shrine was established on the land where the arrow was discovered. 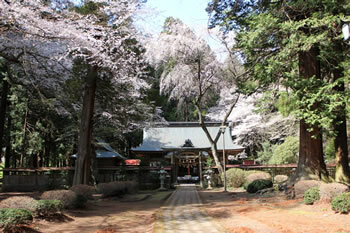 The shrine enshrines both deities, Ajisuki Takahikone and Yamato Takeru. It has long been worshipped as a deity of agriculture. There are many traditional rituals remaining today which are strongly related to agriculture. For example, people collect rice husks of that year and wrap them with straw. This is called Tsuttoko which are offered to the deity and later people bring it home (in the Shimotsuki Festival). Another example is a ritual of rice planting held on January 6 on the lunar calendar. A number of valuable Buddhist art works are preserved in the shrine such as a bronze bowl (Important Cultural Property) and the Statue of an 11 Face Kannon (Important Art Property). 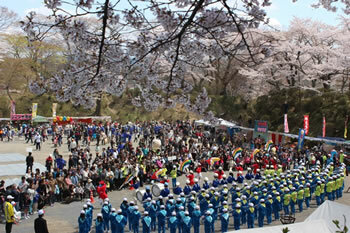 Every year on the second Saturday and Sunday of April is the Jumangoku Tanagura Castle Festival (Cherry Blossom Festival) at Tanagura Castle site (Kamegajo Park). 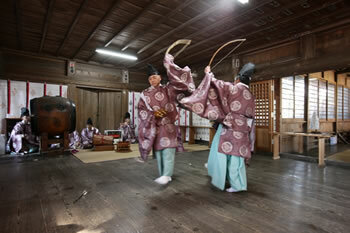 A samurai parade, demonstration of harquebus, and many other stage events are held. 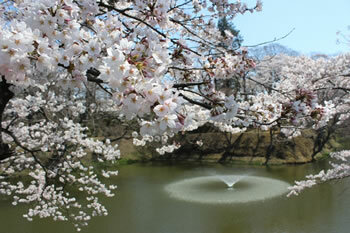 Shops selling local specialties will be open, too, surrounded by the beautiful cherry blossoms. 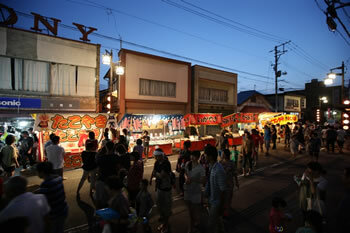 Tanagura Summer Festival is the town’s seasonal highlight. The main street will be car-free and a number of fun events will welcome people. Since the Great East Japan Earthquake, Fukushima Prefecture has been facing great difficulties such as the nuclear accident and its reputational damage. However, local people have remained positive and are working hard to regain their hometown. Tanagura Autumn Festival is a traditional local festival which has continued for 200 years. 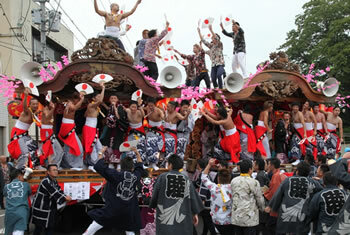 Mikoshi portable shrines and large floats parade around the town along with the powerful sound of Japanese drums. The highlight is when floats are crashed into each other to show people’s strength and see who is the strongest. 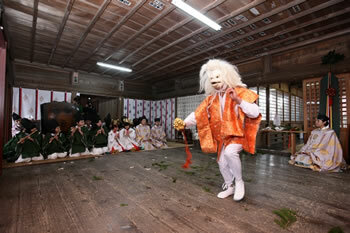 The second Saturday and Sunday of December is the day of the Shimotsuki Festival at Yatsuki Tsutsu Kowake Shrine. Kagura court music and dance (Shichiza Kagura and Daidai Kagura) will be performed in the Hai-den Hall while praying for a good autumn agricultural harvest. Shichiza Kagura consists of seven kinds of dances and a few of them will be selected to be performed. A lot of shops will be open in and around the precinct. It is known as Yatsuki Market where people can buy local specialties such as yuzu citrus and ginger. How this festival was started is unknown but historical records show that it was already established before the Muromachi period (14-16th century), therefore, this festival has a long history of nearly 400 years. 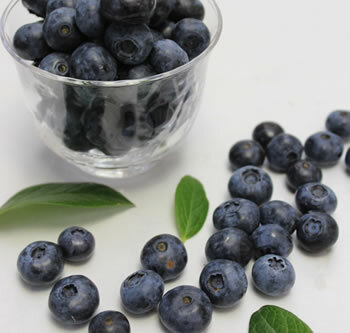 One of the main agricultural products of Tanagura are blueberries. A variety of blueberry items are produced in the town. Jams are not too sweet and use local blueberries grown with organic fertilizers and less chemicals. 100% condensed blueberry juice which contains 25 mg of anthocyanin in a bottle is tasty and healthy.